This palm comes from the rainforest of the Philippines. Producing large bunches of bright red and green fruit around Christmas time in the USA, reflecting it's common name. Natural Habitat: This palm can be found growing naturally in the lowland regions of the Philippines. It is grown EVERYWHERE in tropical countries. with 2-4 leaves born and grown in Hawaii. These palms are grown in USDA approved media for mainland shipment. 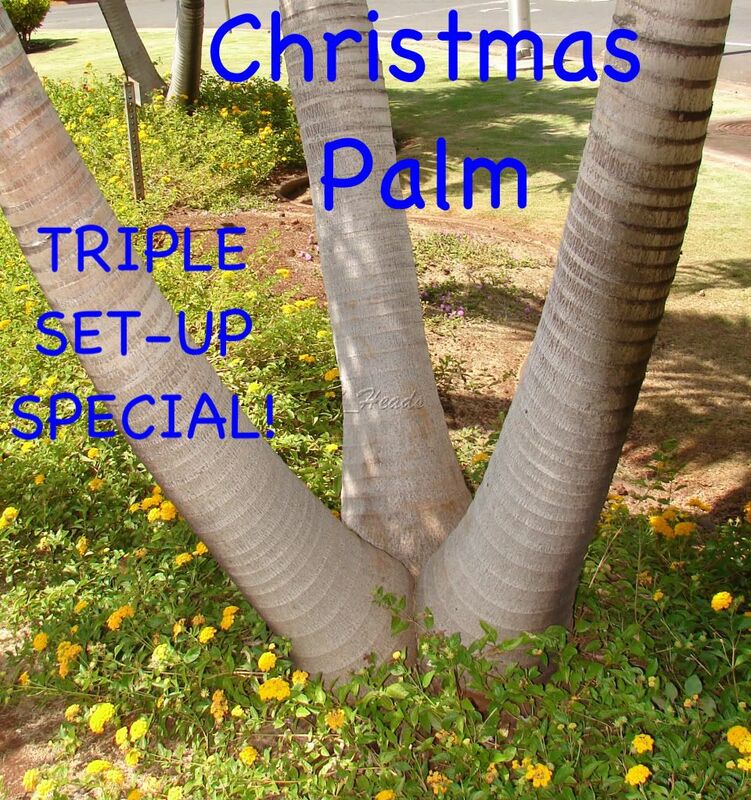 If you are willing to pay the extra cost of inpot shipping these palms can be shipped in their treepots. The quote s/h is for bare root shipping. Inpot shipping will add $10 per palm for extra weight of potting media. Mature height for the Christmas palm is usually around 50 feet, but more like 30 feet in most areas outside of habitat. The grey trunks graduate into a glossy lime-green crown shaft (neck) that is usually 1-3 feet long, and 6-8 foot long curving leaves. The leaflets form a "V" shape if viewed from the right angle. 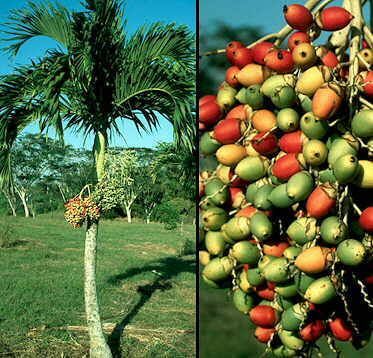 The most notable aspect of this palm is its fruit. Once the palm forms a couple of feet of trunk it will grow white blossoms from beneath the neck. Once the flowers become pollinated, they will form into fruits. The fruits turn green, and then red when fully ripe. 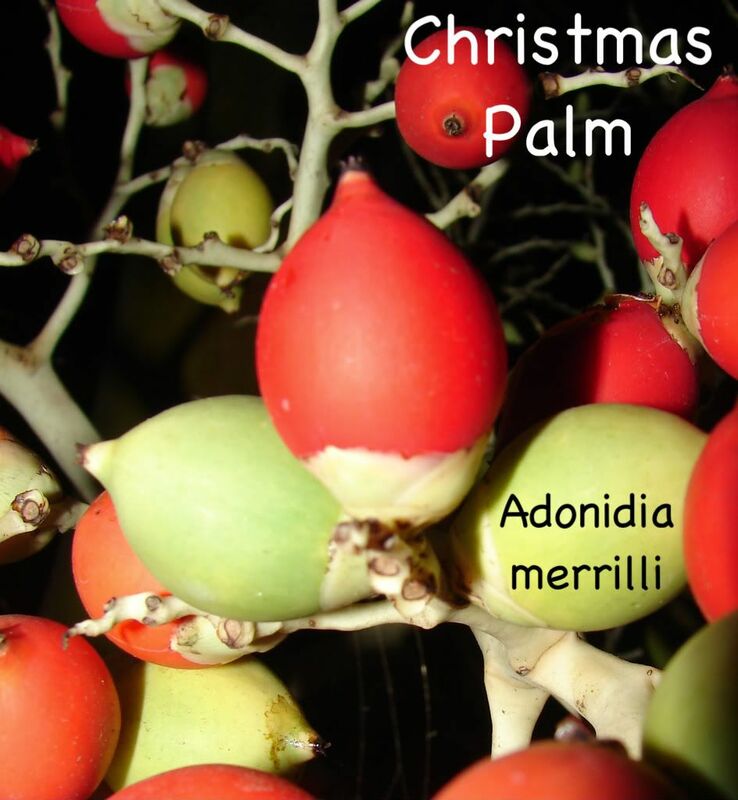 In the Northern Hemisphere, Manila palms often have both green and red fruits at the end of the year around Christmas. THIS PALM IS A FAST GROWER UNDER IDEAL CONDITIONS. 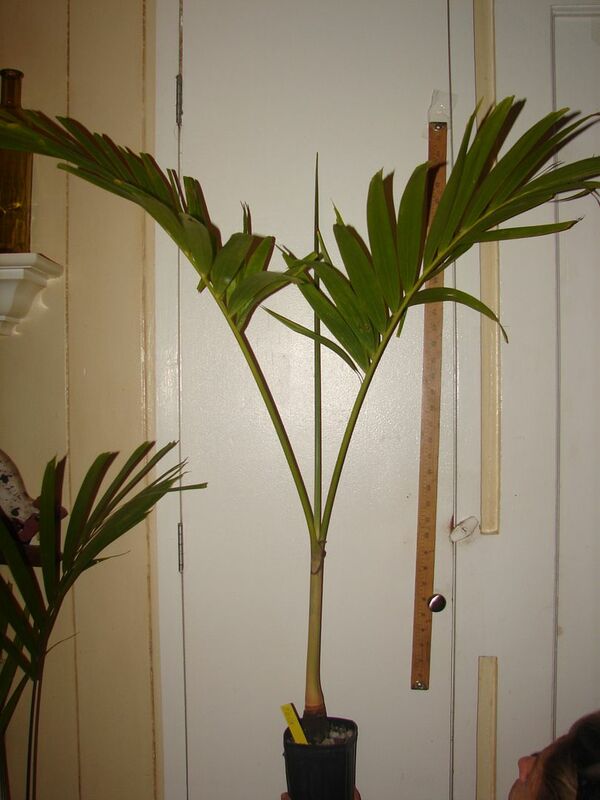 This palm thrives indoors our outdoors and grows fairly fast. It is often used in malls, restaurants, and theaters around the world. It does best in humid areas, especially the tropics. 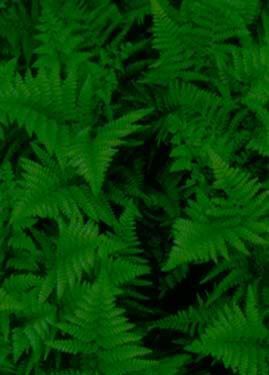 But, it has been grown successfully in sub-tropical climates if given plenty of water and sunlight and protected from drying winds or harsh weather. It needs a sandy or rocky soil that drains well. It will begin fruiting in just a few years in most cases. A very attractive, medium sized, slender, solitary palm with a neat crown of arching bright green leaves. This palm likes sunny, moist, but well drained position. An excellent, fast growing palm.